What is the Network effect N2? 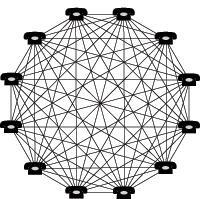 > Blog > Social Marketing > What is the Network effect N2? With Facebook it was the simple and effective design of the site and features which colleague students in America started to use. So, with word of mouth and referral, “are you on Facebook?” a process began which was the Network Effect. This is an example of a Positive Network Effect, whereby the users found they had a way to keep in touch and share information with trusted groups or on campus more like trusted tribes! Just as there are Positive Network Effects there are also Negative Network Effects, I will be a little cheeky here and suggest that the public transport in Melbourne (Trams and Trains) suffers from a serious Negative Network Effect when it rains as it cannot cope with the increased volume and long lines of grumpy wet passengers are the negative result. Not enough capacity = Negative Network Effect. The classic Positive Network Effect which you will most probably have in your home or on you is the home phone or mobile. The more people connected (phone network) the more efficient and useful the telecommunications network became, locally, regionally, nationally and internationally. Well, that was true until we had unsolicited telemarketing calls. So, how do you harness these new forms of The Network Service for your business? 2. The correct strategy to leverage and build a community with these new Network Service Providers such as; Twitter, LinkedIn, Facebook and MySpace without naming all the other web 2.0 possibilities. 4. A strategy to use the networks with a consistent and relevant message for your business. 5. Fun, you have to want to use these to engage with your customers so they enjoy being connected to your business with the benefit that comes with the connection. So there we go, a few lines on what is the Positive Network Effect. I hope this helps to further understand some of why Sean Parkers presentation from the post “Connect or Die: The Network Service and the future of your business!” is so important for all businesses. It is in effect digital Word of Mouth or as Advertisers and Marketers like to abbreviate everything WoM! I will talk about Word of Mouth marketing and digital Word of Mouth Marketing in my next post.